All four Rotary Clubs in the Verde Valley are providing support to victims of domestic abuse. 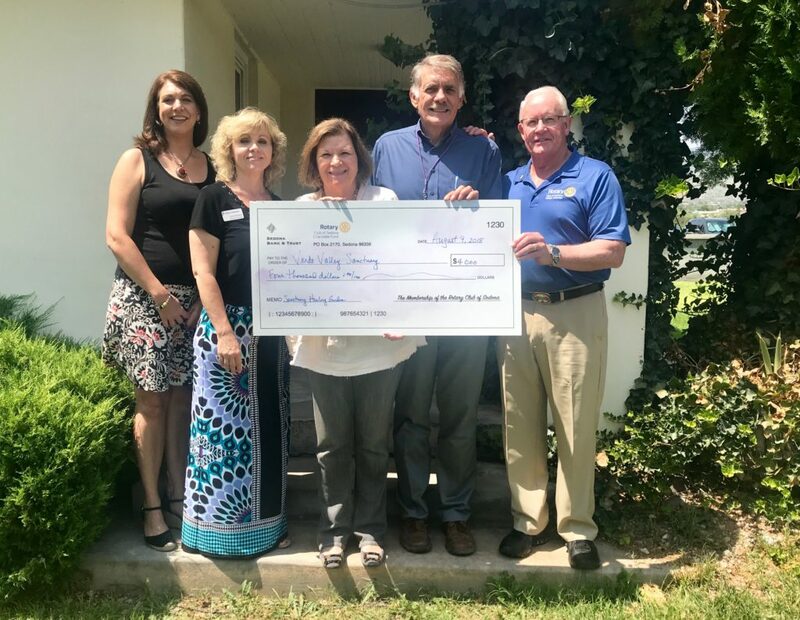 A check presentation was held at the Verde Valley Sanctuary’s Outreach Center located at 601 West Mingus Avenue in Cottonwood on Thursday, August 9, 2018. Jennifer Perry, Development Director VVS, Tania Sims, Membership Chair, Rotary Club of Verde Valley, Holli Ploog, President, Rotary Club of Sedona, Matthew Kelley, Ph.D., Executive Director, V.V.S., Rob Schaefer, President of the Rotary Club of Sedona Village. Holli Ploog, President of the Rotary Club of Sedona presented a check for $4,000 to support the construction of a Healing Garden at the Verde Valley Sanctuary’s Shelter. $2,000 was raised by her club and they received a matching grant from Rotary District 5495. Tania Simms, Membership Chair of the Rotary Club of the Verde Valley presented a check for $1,000 also in support of the Healing Garden Project and Rob Schaefer, President of the Rotary Club of Sedona Village presented a check for $2,100 which was raised at the recent Waters Concert at the Collective. A special thanks to Nikki and John Ramagli, owners of Rotten Johnny’s and J Wine Bistro for selecting V.V.S. as a beneficiary of their grand opening. Earlier in the week, Donna Hawk, Treasurer of the Rotary Club of Sedona Red Rocks delivered a car load of diapers and toiletries that were collected by members of the club for residents in the shelter. The Verde Valley Sanctuary is a non-profit organization dedicated to protecting, assisting and empowering victims of domestic abuse and sexual assault. The five main services provided are: a 24 hour helpline (928) 634-2511, a 28 bed safe shelter, outreach services, legal advocacy and education and prevention. All services are provided completely free of charge and funded through state and federal grants and charitable donations.